[iPhone] Like puzzles games? Fling will provide some furball fun! 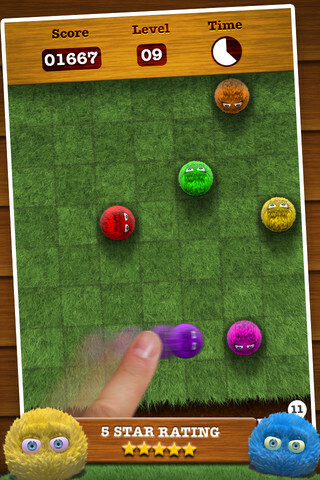 Fling is a popular puzzle game created by the well-known developers at CandyCane LLC. The game features over 10,000 puzzles that are divided into 30 levels of gradually increasing difficulty. The premise of the games is simple, you are given a certain number of furballs on the screen to start. The goal is to fling one into another in order to knock the other off the screen. The puzzle is considered solved if you can do so while leaving only one furball remaining on the screen. Fling contains four different game modes: Free-Play, Arcade, Challenge, and Frenzy. Free-Play allows the user to move through the puzzles at their own pace, while keeping track of all puzzles as you go. Arcade mode introduces timed puzzles, as the user must solve as many puzzles as possible before the time eclipses. Challenge mode also has timed puzzles, but the goals is to beat your absolute best times for each level. Frenzy mode is unique in the fact that furballs keep filling up the board as time moves on and the user must keep flinging them off before the board is full. 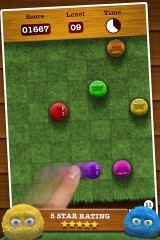 Fling is a clever game with simple game play. Some might read this and think that it might not be too difficult, but the game gets challenging quickly. The problem is that you cannot fling two furballs that are adjacent (i.e. next to) each other. So as the puzzles get more difficult, adjacent furballs can cause major issues in removing furballs from the board and solving puzzles. Thankfully the developer included a very important undo button and what appeared to be one hint per level. Extra hints are available by in-app purchase.